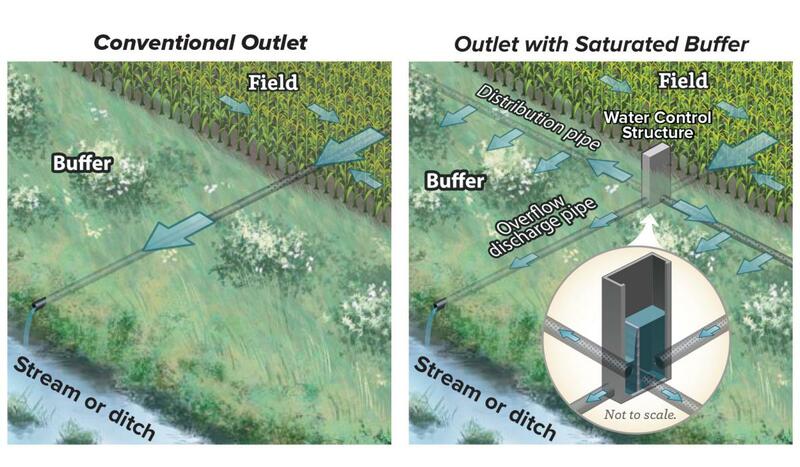 A saturated buffer has a subsurface drainage control structure that diverts the flow from the tile outlet to a perforated distribution pipe that runs along the buffer. The water table is raised in the buffer where the soil filters nutrient removal before naturally entering an adjoining ditch or stream. A saturated buffer is considered an edge-of-field practice. Figure 49. A comparison of a conventional tile outlet (left) to an outlet with a saturated buffer (right). Credit: transformingdrainage.org. low-grade ditches (less than 2 percent) and fairly flat fields (less than 1 percent slope) have subsurface drainage systems. a subsurface main drains at least 15 acres. soils have a restrictive layer and no sand/gravel layers, and where a high water table can be maintained. there is at least 1 percent soil organic matter in the top 30 inches of the soil profile. it does not interfere with farming. The ground surface along the distribution pipe should be at least 24 inches lower than the ground surface at the edge of the cropped field. To prevent clogging, a saturated buffer should not be used to treat animal waste, septic system discharges, or subsurface drainage systems with surface inlets. Saturated buffers reduce nitrogen and phosphorus discharges from subsurface drainage outlets, and they enhance or restore saturated conditions in riparian zones along ditches and streams. Figure 50. A side view of a saturated buffer. Credit: transformingdrainage.org. In a study at eight locations in the Midwest of the United States, 40–100 percent of the subsurface drainage was diverted to the saturated buffer, and the removal of nitrates from the diverted drainage water ranged from 30–85 percent (Jaynes and Isenhart, 2014). Phosphorus removal can be up to 20 percent but is likely to be much less when installed in sub-optimal locations (Jaynes and Isenhart, 2014). An Iowa study saw 35–59 percent tile flow diverted into buffers throughout the first four years (Isenhart, 2015). The average reduction in nitrate concentration was 91 percent for water passing through a buffer root zone (Tomer et al., 2017). Dissolved reactive phosphorus removal is minimal. Once constructed, a saturated buffer is relatively self-sustaining. 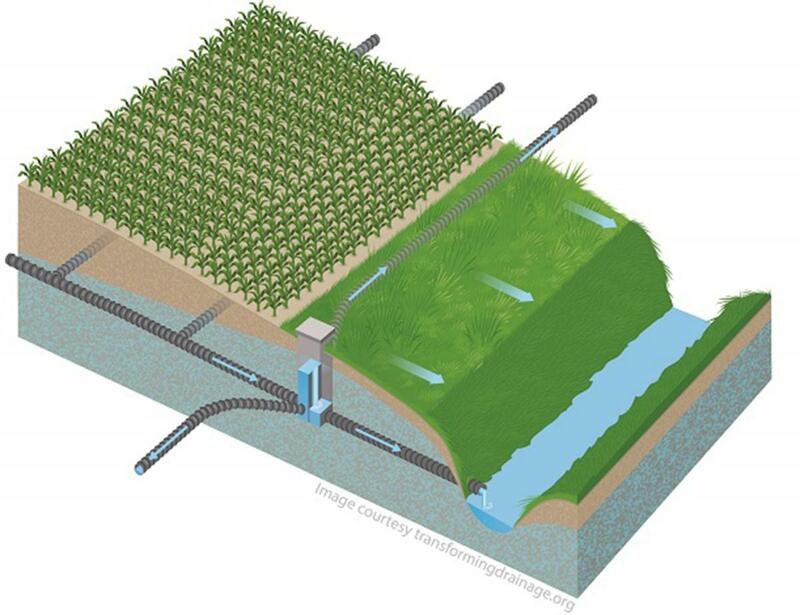 A controlled drainage structure is required to divert subsurface flow to the buffer. A vegetated buffer of 30 feet wide is recommended to maximize saturated conditions and soil-water-plant interactions. Soil organic matter and a restrictive layer are the most critical factors to saturated buffer performance. Once constructed, adjusting the stop logs in the controlled drainage structure requires the similar amount of management as a conventional controlled drainage practice. Costs are site-specific and depend on the size of the control structure and the length of the saturated buffer needed. In a study of 15 saturated buffers in four states, the average cost for materials and installation was about $3,720, and the size of the treated areas ranged from 7–149 acres (Moorman et al., 2015). Nitrogen removal costs are about $1/lb. This is similar to controlled drainage and wood chip bioreactors. Diverted drainage water is treated naturally as it creates saturated conditions in the soil profile. Roots, plants, and microbes work to remove nitrogen from the water. Sediments and associated phosphorus flow into the soil profile where they can be trapped. After drainage water leaves the pipe, it can flow unrestricted to the ditch or stream.